El Niño Southern Oscillation (ENSO) is a natural phenomenon that has occurred for centuries. Ocean and atmospheric conditions in the Pacific tend to fluctuate between El Niño (warming) and a drop in temperature in the tropical Pacific known as La Niña. The fluctuations are rather irregular, but tend to appear every three to six years. A more intensive phase of each event may last for about a year. A warming climate may contribute to an increase in frequency and intensity of the El Niño phenomenon. The impacts may be significant at regional levels. 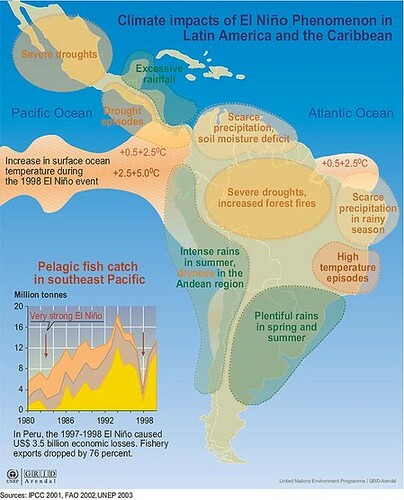 In Central America, El Niño leads to excessive rainfall along the Caribbean coasts, while the Pacific coasts will remain dry. Rainfall increases on the coasts of Ecuador, the northern part of Peru, and southern zones of Chile. In Ecuador, Peru and Bolivia there will be drought in the mountainous and Andean zones, implying retreat of glaciers with subsequent changes in the availability of water and in local biodiversity. In Colombia, Venezuela and Guyana precipitation will tend to be reduced, leading to drought in the Brazilian northeast. In Argentina, Paraguay and Uruguay rainfall will increase and there will be a rise in temperatures in the southern part of Brazil. For any form of publication, please include the link to this page and give the creator credit (in this case Viktor Novikov, UNEP/GRID-Arendal) If the high-resolution file is not available, please contact grid@grida.no for request and permission for usage.